I feel like everyone says this, but I promise I am not kidding you,when I say, I love my home during the Holidays. I love it so much, that I put my tree up over a week before Thanksgiving. The weather had finally dropped, and I honestly just couldn’t resist! Decorating for Christmas has always been one of my most favorite things about the Holidays. As a child, we would make hot cocoa, put on Christmas music and decorate away. Until this day, I do the exact same thing, except more wine and less hot cocoa lol. Since I haven’t lived at home in over 6 six years, I’ve had to start collecting Christmas decor on my own. One thing I have learned is, Christmas decor is not cheap! Which is why I have added more and more, little by little, each year. My favorite places to pick up Christmas Decor are at Marshall’s // HomeGoods, Target, Nordstrom’s, Macy’s & Walmart (Hello Cheap Ornaments!). Be sure to pull everything you already have out, to see what you have, before you start buying. Then once you do start buying, decide where you can save. For example, I highly recommend buying basic ornaments at Walmart. Then buy more fun & unique pieces at places like Target. Another thing I make sure to do is, I make sure that all of my Christmas decor easily ties in with my current home decor. As you can tell, we went for more of a white & gold theme to match the apartment. Also, be sure to pick a tree that’s right for your home, as well as one that’s right for your budget. I really wanted a white tree this year, or at least a real one, but opted for the fake/pre-lit green one, I have used the last three years. I bought this tree from Walmart and it was honestly such a steal. It is 7.5 feet tall, pre-lit and under $100. You can find it here. If you’re a new graduate, living in a apartment and are wanting a tree, but not wanting to break the bank, I really recommend it! It’s also super easy to set up. One trick I recommend to make it look more full, is to use ribbon along with the ornaments. I also like to make sure I have a million holiday candles burning all at once. As in, I want my house to smell like a Christmas cookie at all times – lol. Just make sure you’re buying your Holiday candles at places like HomeGoods and not at places like Bath and Body Works, where they are charging $22 a candle. Another thing to keep in mind is, don’t be afraid to move your rooms & previous decor around to make your Christmas decor work! How do you guys decorate?? Good Morning, welcome to my home, again! One of my favorite things about fall & winter, is all the decorating that comes along with it. Perhaps it’s the dessert scented candles that should get all of the glory, but something about this time of year makes our home just so much more inviting!! This year, to save my self from having to put up & take down too many decorations in between Halloween and Thanksgiving, I’ve chosen pretty neutral decor choices for the fall. I mainly centered our home around white pumpkins & lots of candles. I’m not kidding when I say I pretty much have an obsession with the two of those. I literally have white pumpkins and candles burning everywhere! The white pumpkins are just so inviting (they’re like the pineapples of the season!) and the candles make our home smell scrumptious. Speaking of scrumptious. During this time of the year, I always have yummy snacks for guests on hand! My favorites to keep around the house are my Flourless Pumpkin Chocolate Chip Cookies and Spiced Pecans ! Literally, so good. Another easy touch to add to your home, is a simple holiday pillow. Spring & summer, I have a pineapple pillow as the main focus of our couch, then for the winter I have a Christmas tree pillow and then I picked up this pumpkin pillow for the fall. I have to say, even Bentley is in the fall//Holiday spirit! I picked him up from the groomers last week and they put the cutest Halloween bandana on him. You can’t tell from the pictures, but they have little bats on them! He looks adorable – lol. One thing I am also doing this fall is decluttering. I’m not sure if “autumn cleaning” is a thing, but it definitely has been for me. I have been throwing things away and giving them away left and right. Actually, this is the last time you will see our apartment looking like this! Change is happening people – lol. If you’re wanting more Halloween decor, check out my picks here! Happy Friday Friends! Cheers to the weekend! We’re heading to Austin this morning for ACL and I’m starting to get pretty pumped. Definitely ready for a full weekend of good friends and great music. Above are all of my favorite Halloween & Fall Home Decor. Totally chic, not tacky and definitely, not boring. 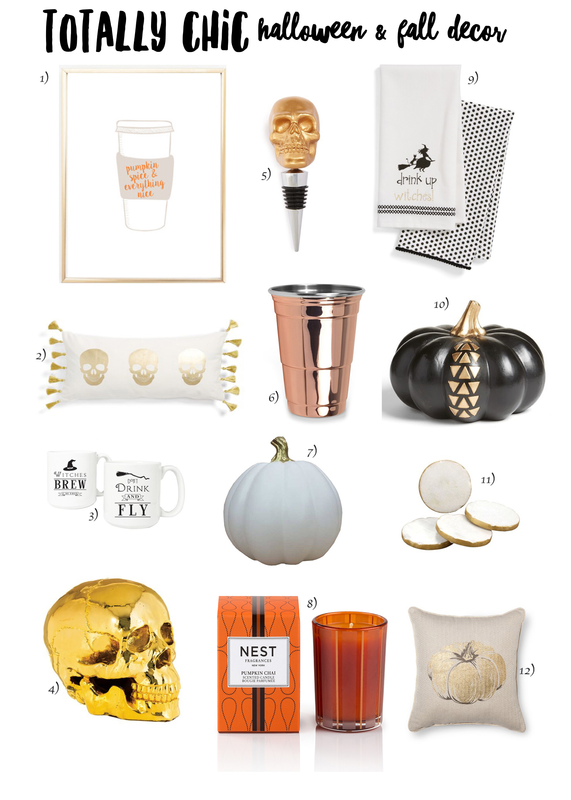 I want this wall print to go above my bar cart, this pumpkin pillow for my couch, and how cool is this gold skull? So chic. When I was in high school, a friend of mines mother, would not let her leave the house, until her bed was made and her bedroom floor was vacuumed. At this time, in my high school mind, I always thought of this as a total drag. But now? I think her mother was a genius. So the following are my tips. 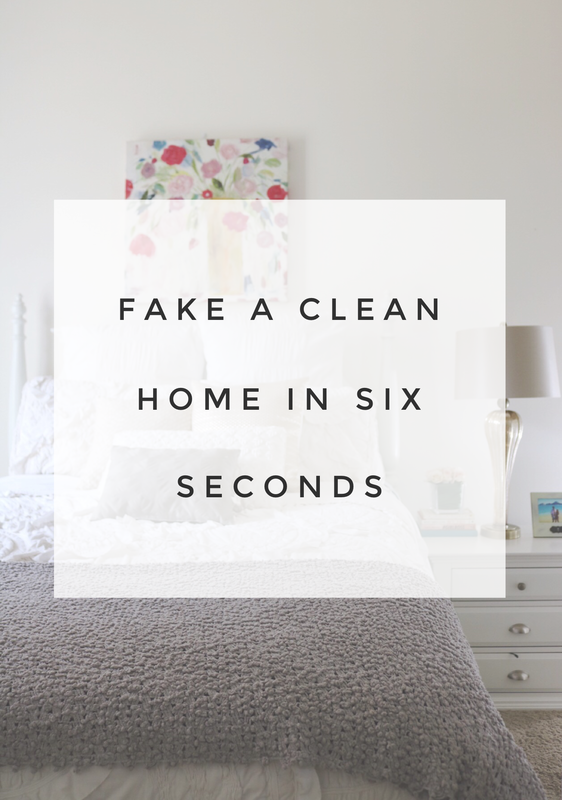 The little chores I try and do every day to keep my home clean and ready, not only for guests, but for my self included. Make Your Bed: Make your bed, every single morning. No ifs, ands, or buts. This is the easiest of them all and if you only follow one of these rules, this should be the one to be followed. Making your bed, not only sets the tone for the whole day, but it will instantly make your bedroom feel less cluttered. No dishes in the sink: There is absolutely no reason to leave your dishes in the sink, if you have an empty dishwasher sitting right next to it. This is my biggest pet peeve. If the dishwasher is full & clean, I understand the procrastination. My suggestion is to try to set aside a specific time, a day to unload and load the dishes. For example, Colton and I take turns doing this first thing when we get home. Do not have clothes on the floor or laying around: Make it a habit to always immediately hang up your clean clothes and put dirty clothes in the hamper. The longer you wait, the more clothes accumulate. If I decide not to wear something, I immediately hang it up. Vacuum or Sweep: Depending on the type of floor you have and especially if you have dogs. I swear, a house could be a total mess, but if I see the carpet is vacuumed, I immediately think the house is cleaner. If you are constantly on the go and do not have time to vacuum. I highly suggest investing in a rumba. We were actually gifted one from Colton’s parents two years ago and it has been a total game changer in the dog hair department. Wipe Off Kitchen Counter Tops: These wipes have been complete life savers. They make wiping kitchen counters easy because there is nothing more gross than seeing left over food on the counter. Plus, it’s so easy. Do you have to wipe down every counter in your home? No -lol, but try to make it a habit to wipe off the counter after every meal is cooked. Fold Blankets and arrange pillows: We try and do this right before we go to bed. Even though they are just pillows and blankets, it’s amazing the difference it can make if they are folded and in place. What are your tips for a tidy home?